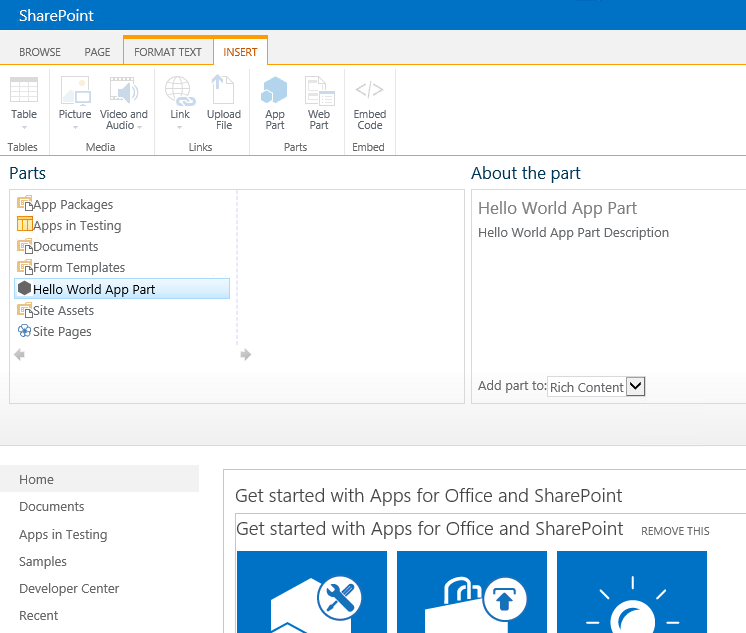 Jeffrey Paarhuis SharePoint Blog | SharePoint Configuring, Developing and Designing. 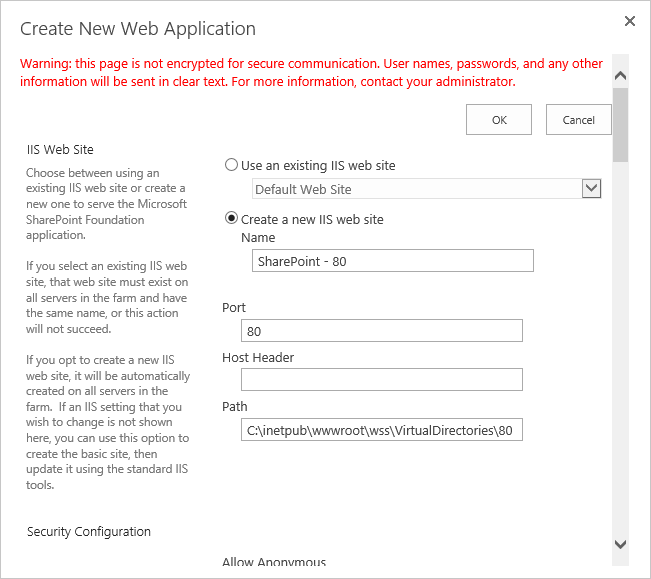 Assuming you have a MSDN subscription or any other kind of Azure license and wanting to try out SharePoint 2016, here are the steps to follow to install a SharePoint 2016 IT Preview Virtual Machine in Azure. 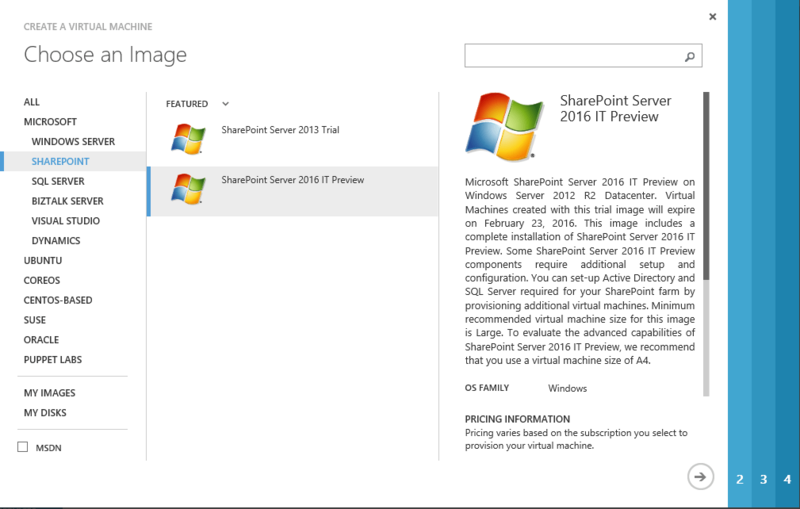 It’s good to know there is a pre-baked SharePoint 2016 IT Preview Virtual Machine already in the Azure Virtual Machine gallery. 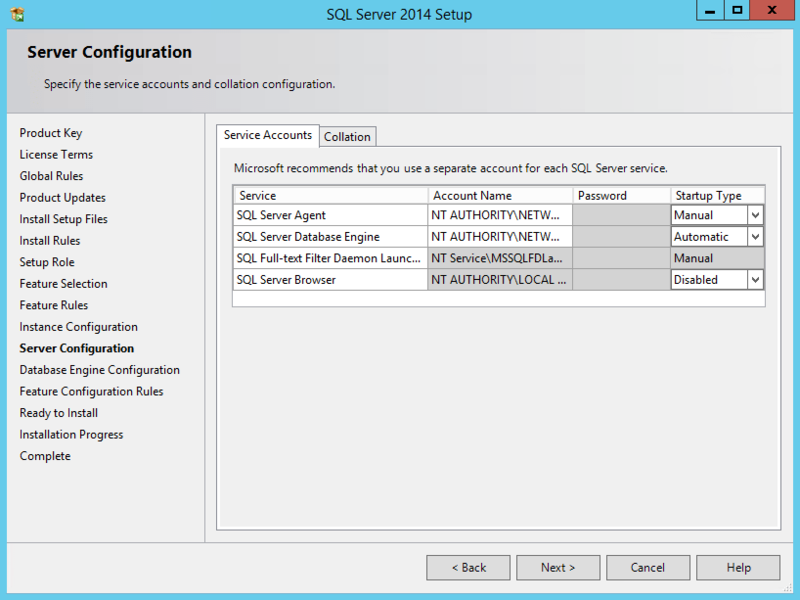 This way you only have to install SQL server and configure SharePoint correctly. This can be done in an hour. 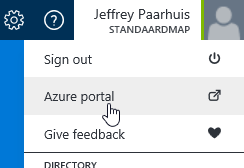 Log in to Azure and go straight to the old Azure portal (if you aren’t already there). This is because the Virtual Machine isn’t available with the new look and feel or they’ve done a good job in hiding it. 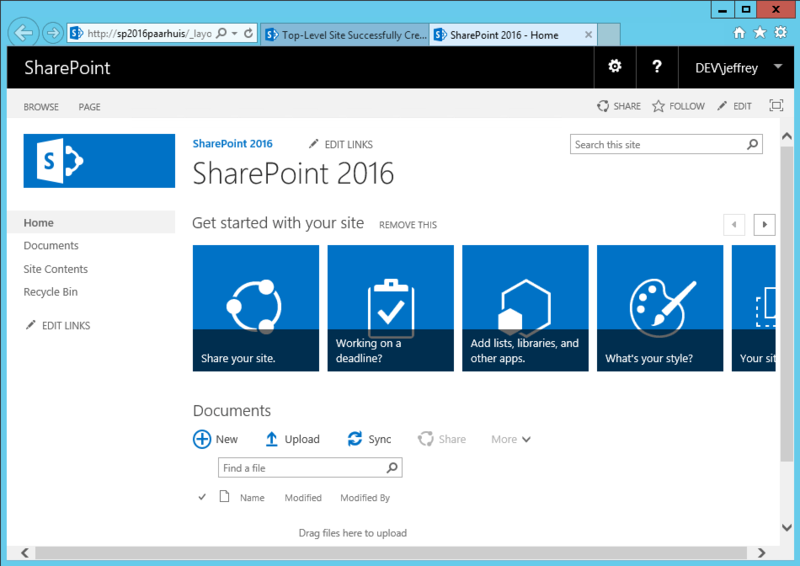 Head to the Virtual Machine Gallery, select the SharePoint category on the left and select the SharePoint Server 2016 IT Preview image. 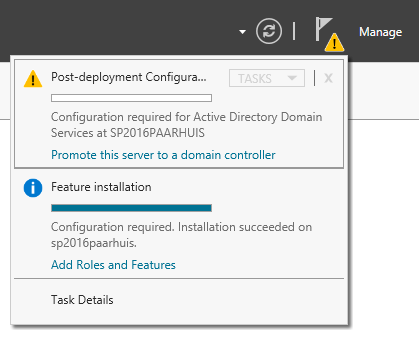 Choose a unique name for the Virtual Machine name like sp2016paarhuis I’m using. 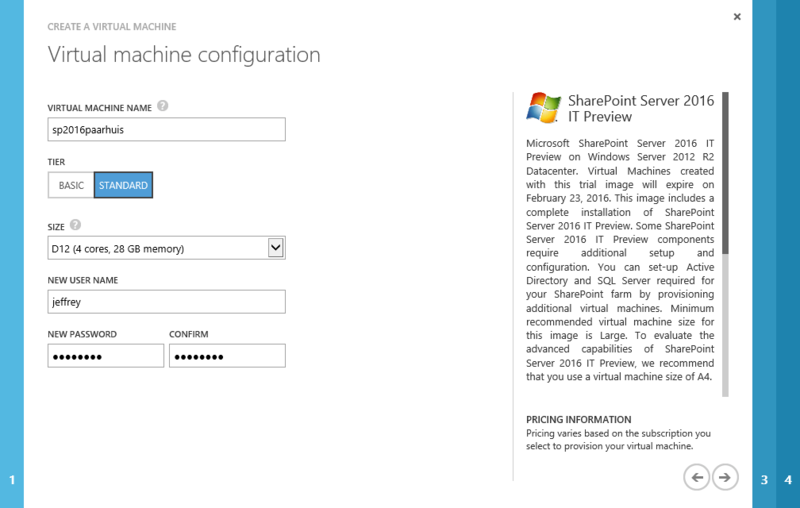 Now, if you wan’t to use this SharePoint machine on a regular basis and are stuck to an MSDN subscription the Basic Tier with an A3 is the best option. This is sufficient for such a machine and it will fit just in a MSDN Premium subscription without having to turn it off. But if you just want to try it out once or twice you can go with the Standard Tier and a D12, just for speed. Choose a username and password and continue. On the next two pages change the Region to your zone and keep the rest as-is and finish the wizard. Wait for the machine to be provisioned and started, this might take a few minutes. 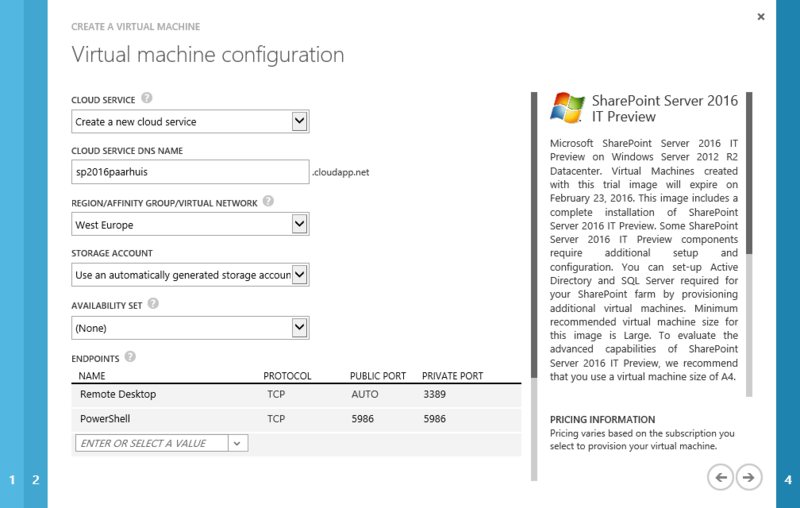 Once the machine is up-and-running you can connect with the machine (using the Connect button in the Azure portal). 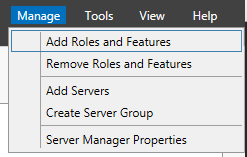 You will see that there is no Active Directory yet (which is highly recommended) and no SQL Server which is also mandatory for the single server SharePoint farm. 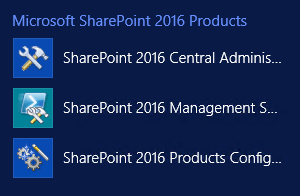 The only thing pre-installed is the SharePoint setup. 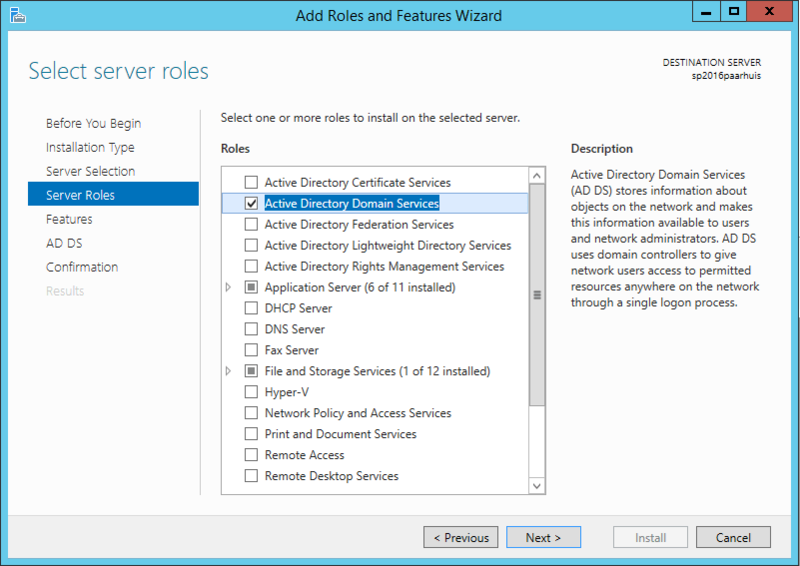 On the Server Manager add an Active Directory server role. 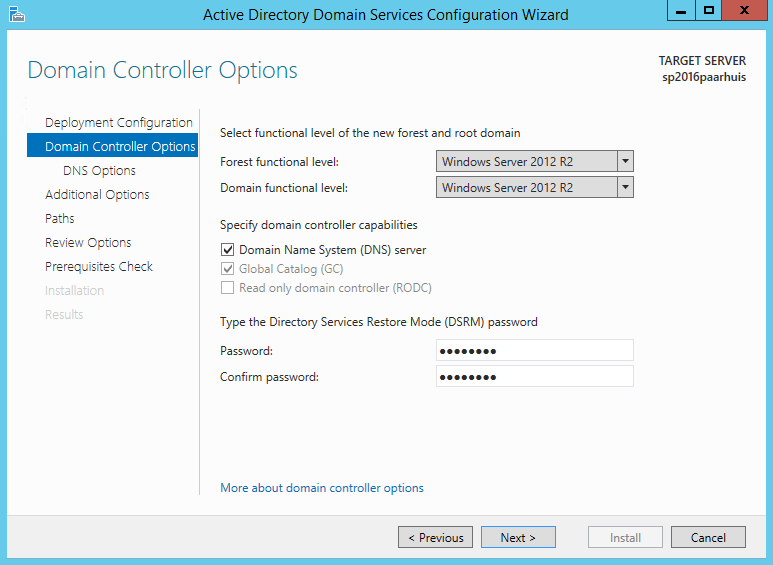 Select the Active Directory Domain Services role and accept installing the required features. Installation doesn’t require the server to restart so you can choose whatever you want in the last step at the automatic restart. Now wait for the installation to finish. I’m getting a coffee if you don’t mind. 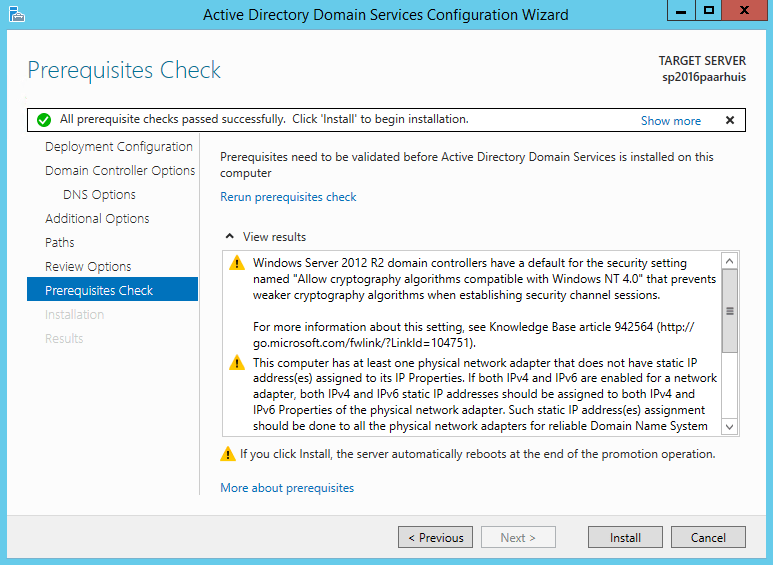 Now promote the server to a domain controller. Click Add a new forest and specify a root domain name like my dev.local. On the next screen just fill in a DSRM password and continue the wizard leaving all default settings. You can ignore the warnings, just click Install. The machine will reboot. 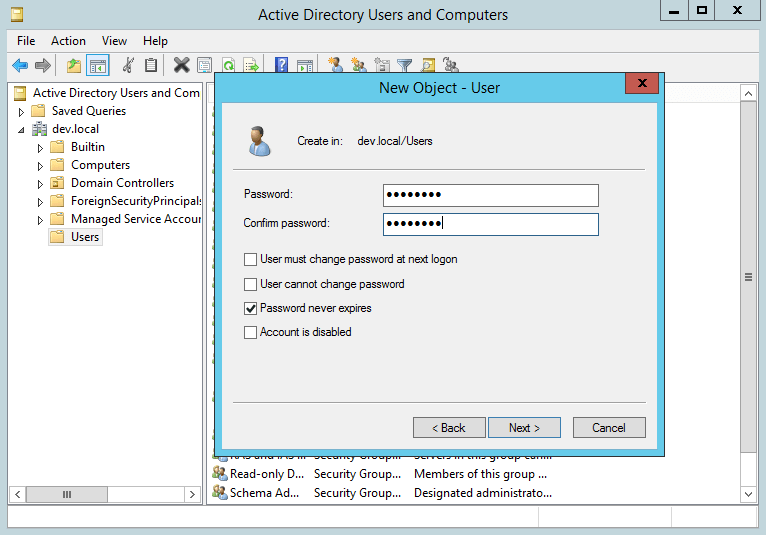 You need to reconnect using the domain credentials, dev\jeffrey in my case, to connect as the domain admin. The AD and DNS are now all finished, next step is SQL. 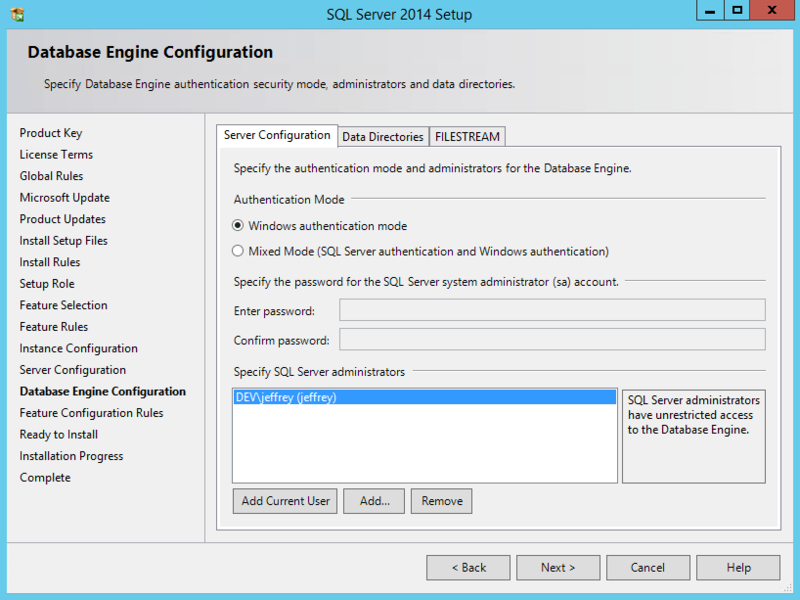 Find a way to get the the SQL Server 2014 with SP1 ISO on the Virtual Machine. 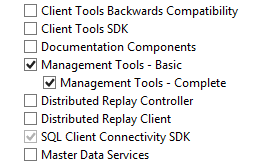 I downloaded the Enterprise Edition ISO from MSDN. If you’re experiencing any issues downloading files in Internet Explorer, set the Internet zone Security settings to Default level. 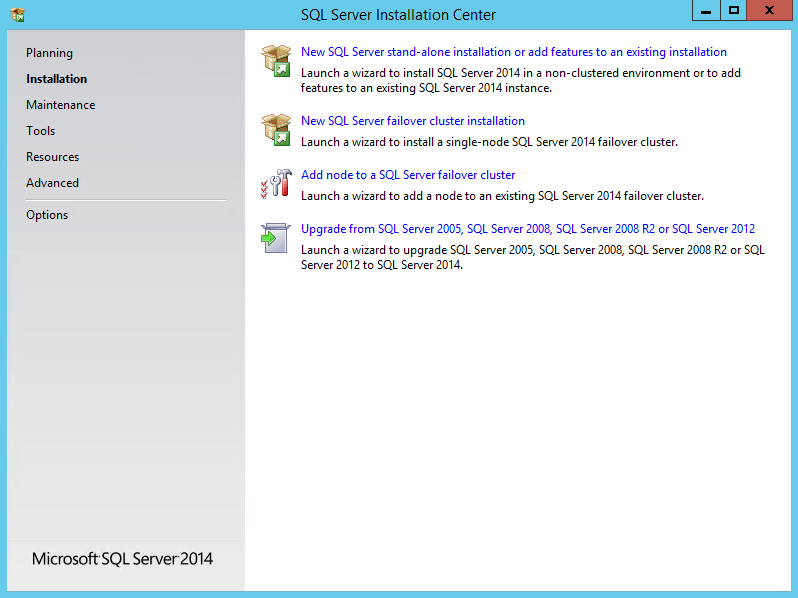 Mount the ISO and start installing SQL Server 2014, choose to install a new SQL Server stand-alone installation. 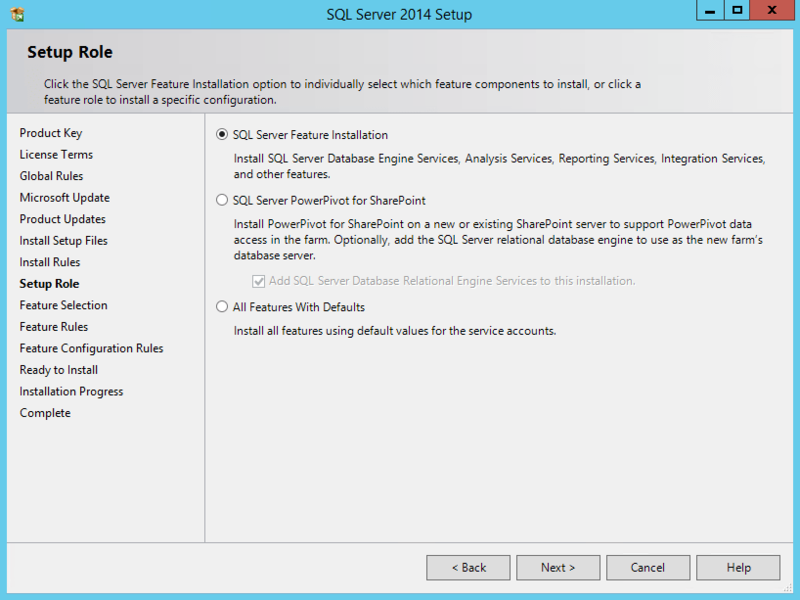 At Setup Role choose the SQL Server Feature Installation option. Install the Database Engine and the Full-Text Search and also the complete Management Tools. Warning! At the Server Configuration select the Network Service (NT AUTHORITY\NETWORK SERVICE) for both the Agent and Database Engine. The default accounts cripple the installation. 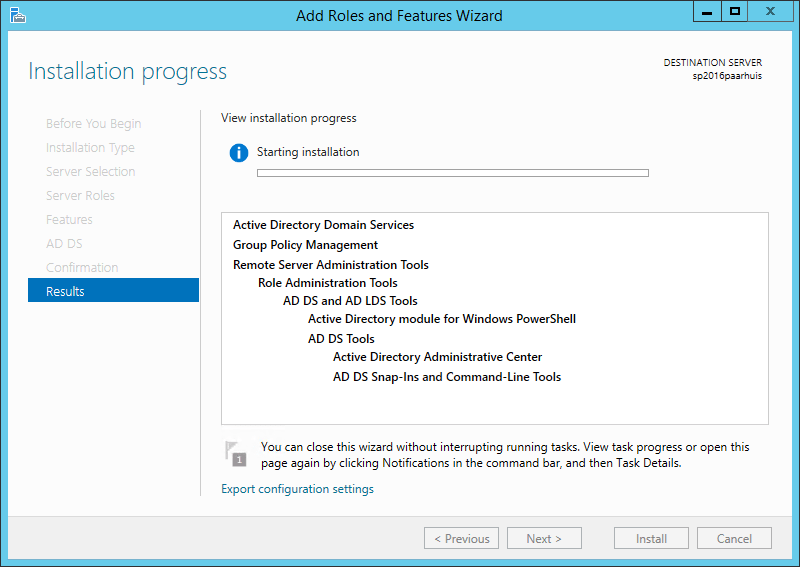 Continue the wizard, add the current user as admin and start the installation. 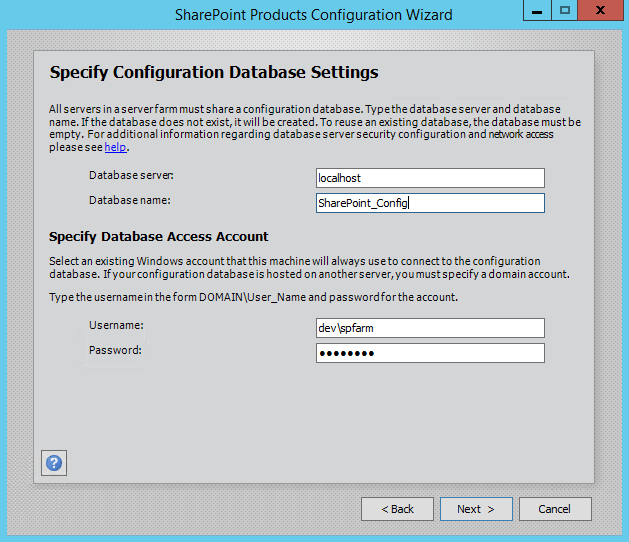 If SQL is installed all and well, the final step is to configure SharePoint. 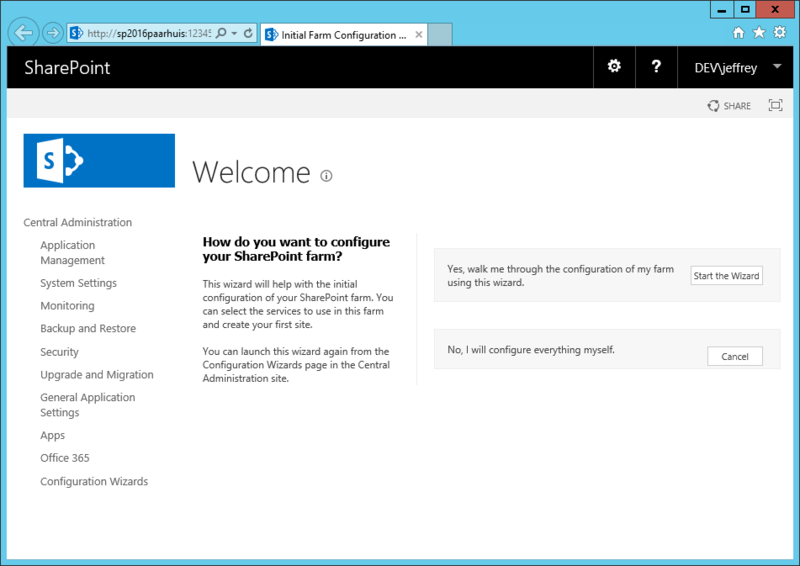 Before starting the SharePoint configuration we need to create a SharePoint service account. 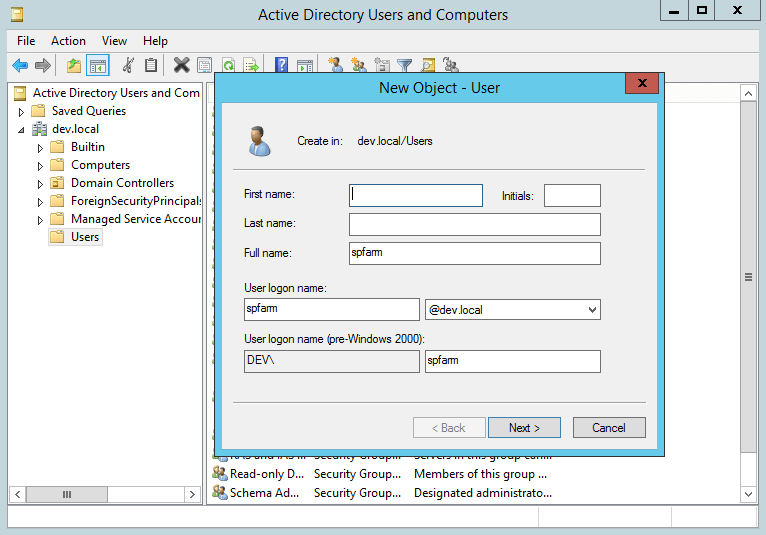 Go to Active Directory Users and Computers and add a new user named spfarm. Just like any other service account fill in a password and only select the Password never expires option and finish the user creation process. 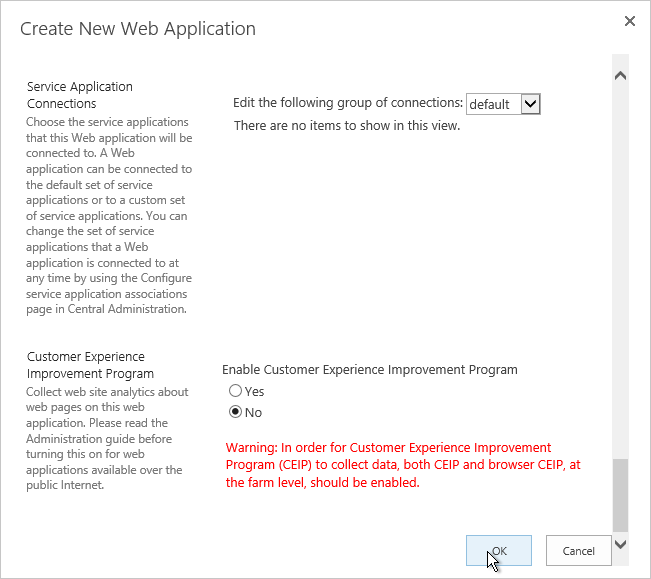 Now, open the SharePoint 2016 Products Configuration Wizard from the Windows start menu. On the second screen of the wizard, choose to create a new server farm and click next. 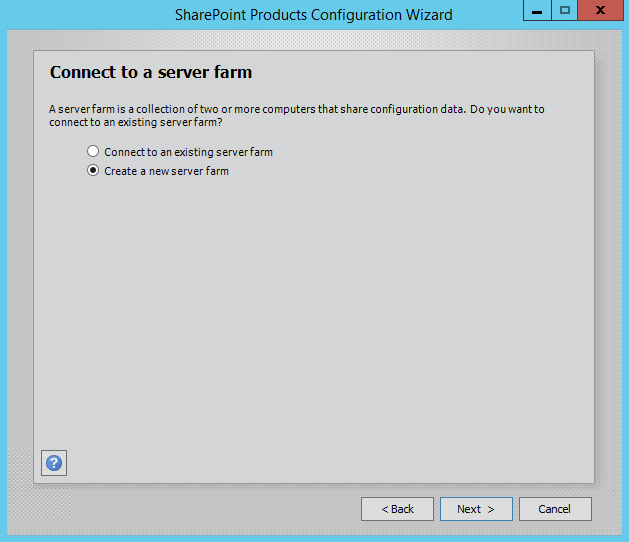 For the Database Access Account we use the newly created SharePoint farm user, the database server is localhost. Continue the wizard by filling in a passphrase. 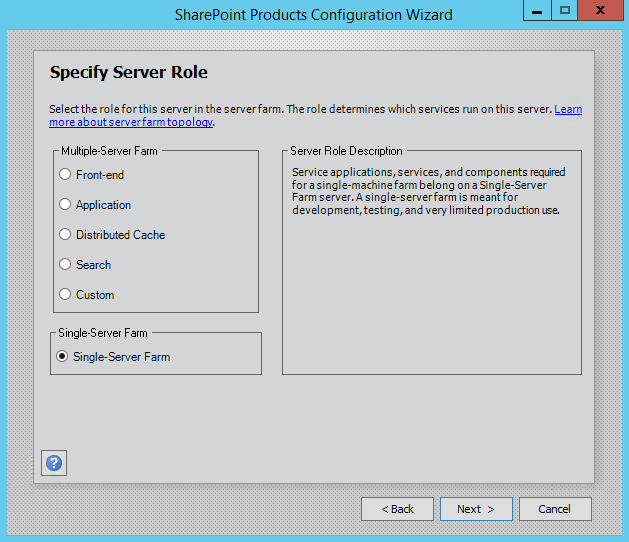 At the Specify Server Role screen you will have to select the Singe-Server Farm. 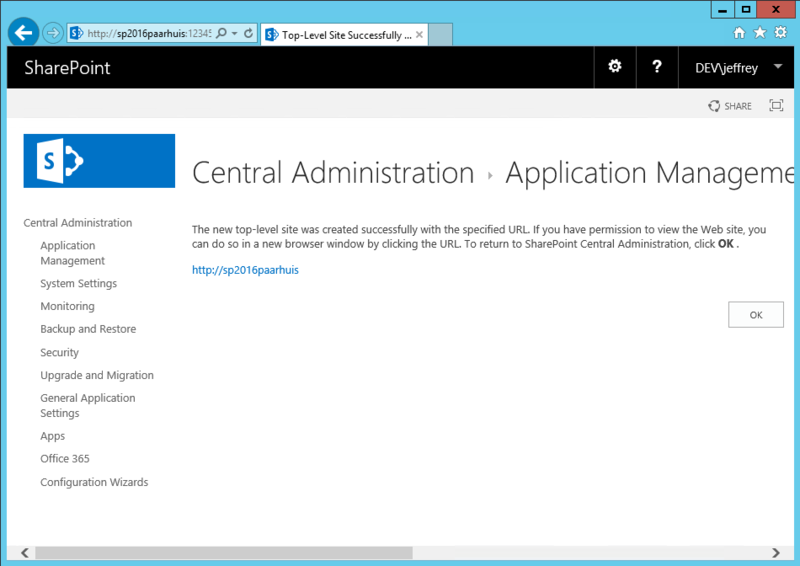 Choose a central admin port (or not) and continue the wizard until the configuration of SharePoint begins. When the setup is done you will be taken to the Central Administration site. 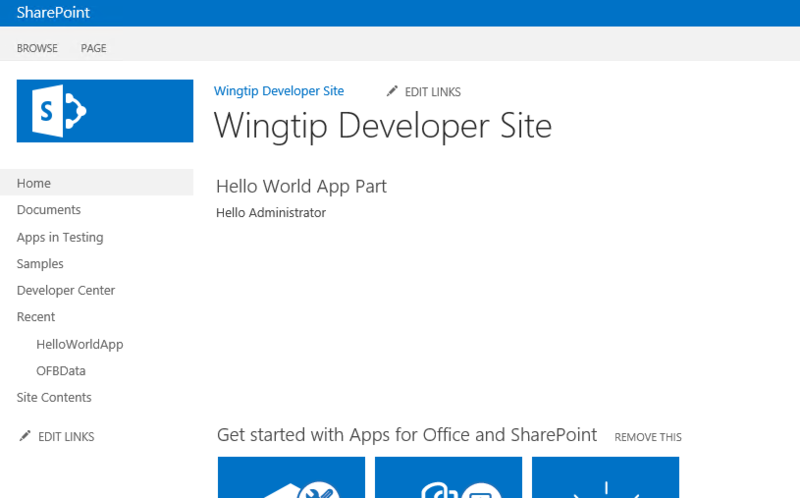 SharePoint is now completely installed and you’re ready to create your web application and site collection. If you wan’t me to take you through the process of creating a site collection, please read on. 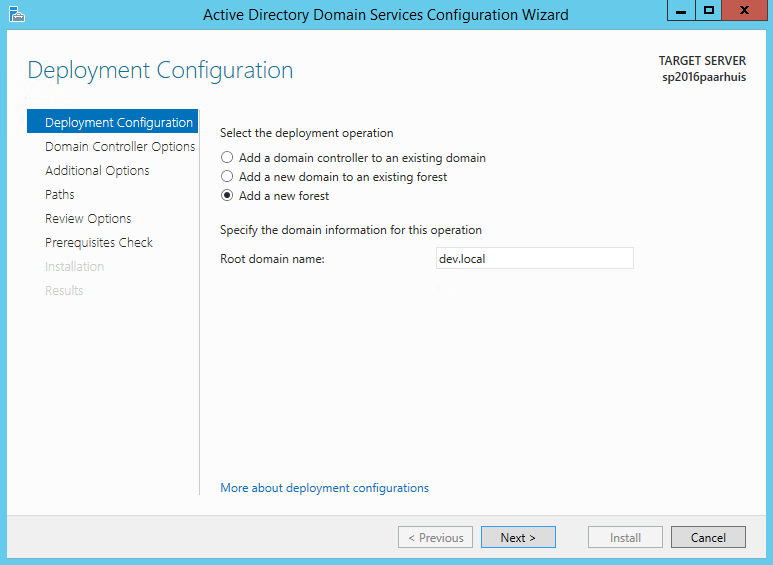 In central admin, don’t follow the configuration wizard, but configure it yourself. Under Application Management go to Manage Web Applications. 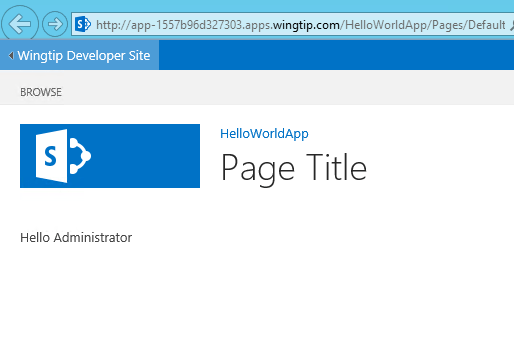 Click New to create a new web application. 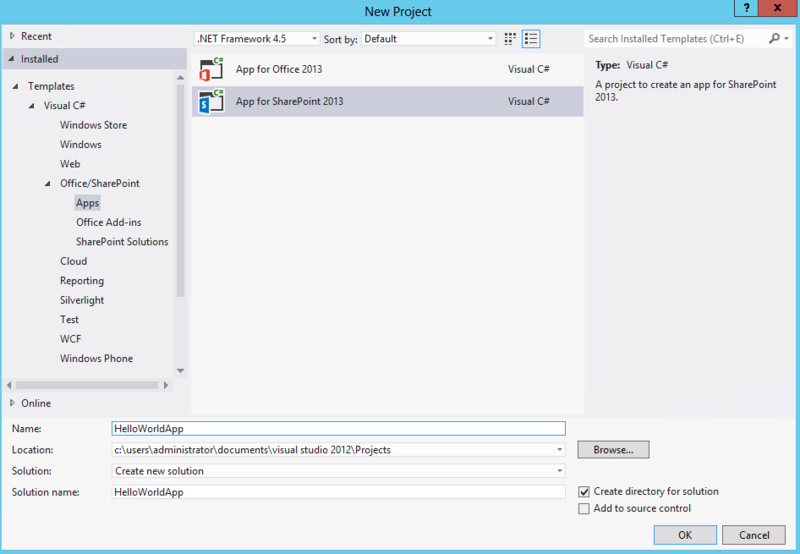 Use the default settings to create the main root web application. Creating the web application can take a few minute, after a while the process will be done and you’re good to go to create the site collection. 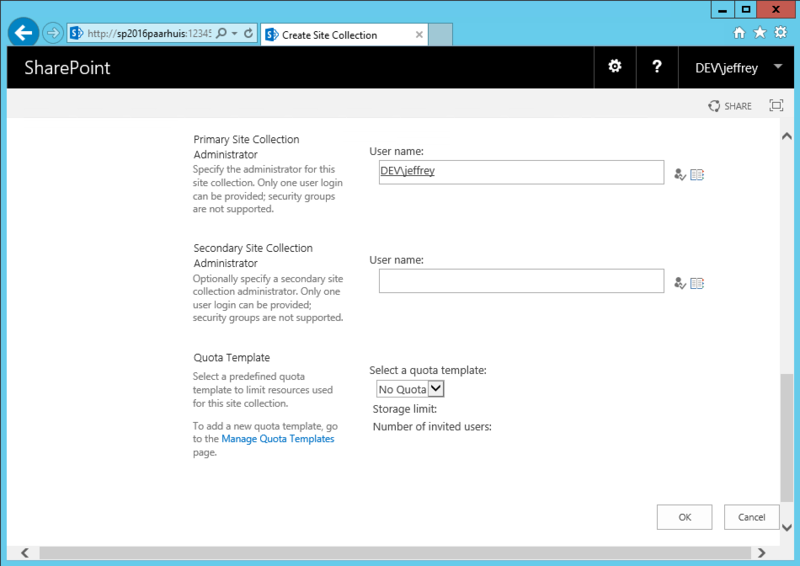 Go back to Application Management and go to Create site collections. Your new web application will be automatically selected. 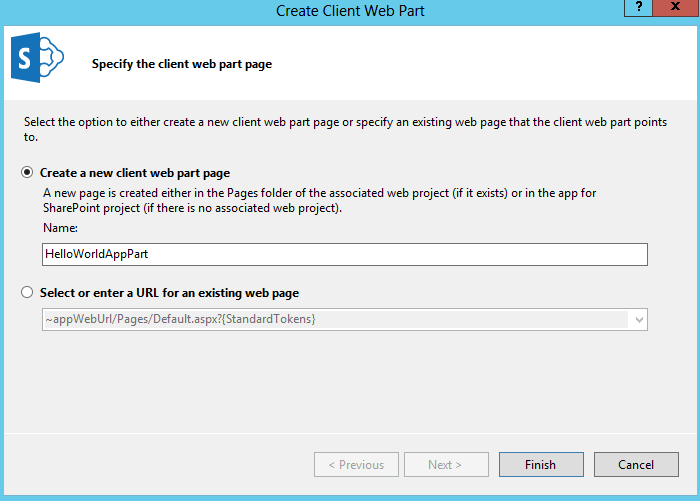 Here you will have to fill in a site title, select a template and add yourself as the primary site collection administrator. Create the new site collection and when finished you’re left with the option to head to the newly created site directly by clicking the link displayed. 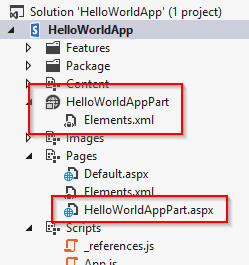 $FBA = New-SPAuthenticationProvider -ASPNETMembershipProvider "MyMembershipProvider" -ASPNETRoleProviderName "MyRoleProvider"
Set-SPWebApplication -AuthenticationProvider $NTLM,$FBA -Identity $webApplication -Zone "Default"
Audiences in SharePoint Online are as good as useless, because the audiences are compiled once a week. Unless you exactly know what you’re doing you can give it a try, but waiting a week to get your audiences compiled and afterwards finding out that you forgot one property is not very satisfying. According to this forum, the compiling will be once a day in the future. So, lets wait for that.